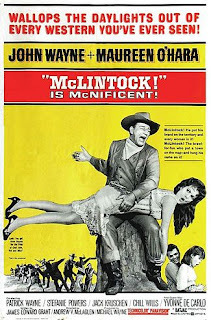 McLintock!. Dir. Andrew V. McLaglen. Perf. John Wayne, Maureen O'Hara, and Patrick Wayne. 1963. DVD. Paramount, 2005. McLintock! has been described as a derivative version of The Taming of the Shrew, and I suppose it has some elements that fit the general idea, but if it weren't for some Shakespeare quotes (neither of them from Taming), I wouldn't have thought there was any direct connection to Shakespeare. A rich cattle baron named G. W. McLintock (played by John Wayne) is separated from his wife (played by Maureen O'Hara), who's been dancing with the governor of the state and generally showing him up. Katherine Gilhooley McLintock (people keep calling her "Kate," and she always corrects them) arrives in the town so that she can take her daughter away with her as soon as she returns from college. There's the usual tension between ranchers and farmers and Native Americans and government officials and the usual sort of love triangle between the daughter and two young men in the town. The film presents both mother and daughter as in need of taming. Once the men spank them, they're all back in love with each other and everything can end happily. But as to anything more specific than the continual "They call me Katherine that do speak of me," there's not much in the way of any direction plot connection to Shakespeare plays.